It’s important for a modern-day Queen (that’s you!) to live a balanced and satisfying life. Taking care of your space, skin, and mind are just a few ways to put your best foot forward. Mikki Taylor, author of EDITOR IN CHIC, shares rituals that will affirm the Queen inside of you. Establish a signature scent to enhance your serenity? Incorporate dimmers or antique lamps with sensuous lighting? Add a chaise lounge or settee? Make your bed a vessel, with the most inviting linens and luxurious pillows? So do your body and your internal beauty a favor by picking up a long-handle body brush and making this easy detox a part of a morning ritual. We all need some more “me time.” Our editors share these helpful tips. Excerpted from Editor in Chic by Mikki Taylor. Copyright © 2018 by Mikki Taylor. Used by permission of the publisher. All rights reserved. “First Lady of Beauty” and trusted lifestyle expert Mikki Taylor shares uplifting advice for women who want to cultivate their beauty both inside and out.Mikki is that girlfriend-in-the-know who you wish you could take everywhere you go—and now you can! Written in her signature, no-nonsense style, Editor in Chic delivers fabulous advice that will give you the confidence to be your best self every single day. From dress code to life code, Mikki shares hundreds of her favorite secrets, including the five products you need to perfect your complexion; the genius ingredient for living comfortably in heels; how to define a bankable wardrobe, be frugal, and look fabulous; unexpected drugstore buys that will give your everyday look a wake-up call; rules for mastering eye-catching makeup and the perfect red lip; ruminations on the challenges of hair loss and effective solutions; what really has the power to motivate or defeat you; why being “risk adverse” is to be “success adverse”; and much more. 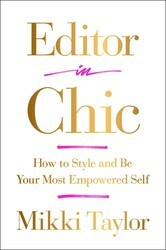 Whether you’re standing in front of the mirror debating what to wear to a last-minute event or trying to hold your peace in the middle of a confrontation, Editor in Chic gives you the necessary tools to stay affirmed, informed, and inspired in all aspects of your life.